After a failed Load Rejection Test last month, Kimanis Power Plant finally kicked start commercial operation of of its power plant, which I 'suppose' is good news. When I posted about the LRT (with high hope) last month, Mr Turbineman (Thomas Lee) commented it normally points to not-so-good news and true enough this KPP had issues with gas supply from SOGT, which was not even the test itself, and that lead to postponement of the LRT. Subsequent test was carried out later and an engineer friend who works there said KPP was ready to go supply power. Soon afterward the power plant came online on 16 May 2014. 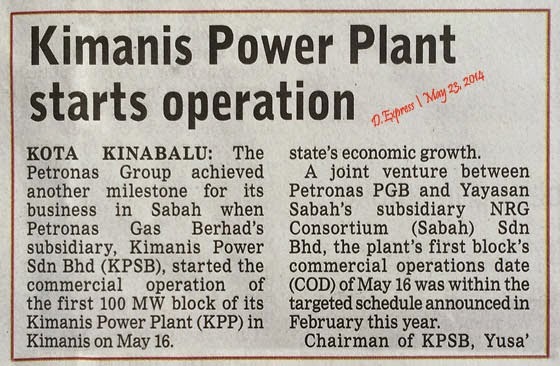 The Petronas Group achieved another milestone for its business in Sabah when Petronas Gas Berhad's subsidiary, Kimanis Power Sdn Bhd (KPSB), started the commercial operations of the first 100 MW block of its Kimanis Power Plant (KPP) in Kimanis on May 16. The KPP, one of several petroleum and energy related projects developed by the Petronas Group in Sabah, is expected to contribute significantly to the reliability and security of power supply in the State, once fully operational. The three-blocks, 300 MW gas-fired power plant is a key project in the "Power Up Sabah" initiative, established under the Malaysian Economic Transformation Plan (ETP). The plant utilises natural gas from offshore Sabah. Besides strengthening the Sabah electricity grid, the successful start of the commercial operations is a significant milestone in providing a reliable source of energy towards supporting the State's economic growth. A joint venture between Petronas PGB and Yayasan Sabah's subsidiary NRG Consortium (Sabah) Sdn Bhd, the plant's first block's commercial operations date (COD) of May 16 2014 was within the targeted schedule announced in February this year. Chairman of KPSB, Yusa' Hassan, said this achievement was a significant milestone for the company after many months of meticulous planning and hard work. The COD for the plant's second and third 100 MW blocks is scheduled in the third quarter of 2014. PGB owns 60% of KPSB while NRG Consortium owns the remaining 40%. TheGreenMechanics: Hope there'll finally be light at the end of the never ending 'blackout' tunnel! I really hope we have seen the light at the end of the tunnel.